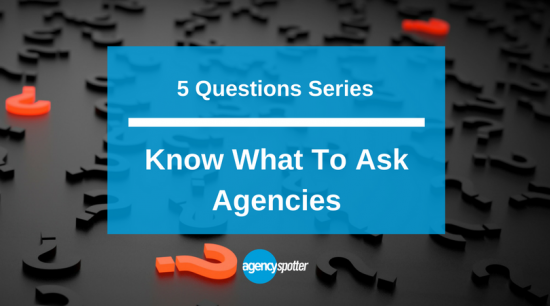 What 5 questions do you need to ask your next agency partner before you hire them? The 5 Questions Series is a marketer’s resource. When you’re looking to find a new content marketing partner or tasked with interviewing a shortlist of advertising agencies and helping decide who will both drive the best ROI for your company and be a partner you enjoy working with. No one wants to choose the wrong digital marketing agency or user experience design partner. Make sure you explore the 5 questions that are applicable for your agency interviews whether that is for your next advertising partner, branding agency, or product design firm. Agency Spotter covers more than 35 service areas from web design to mobile, from user experience design to social media. Ask smart questions to your future agency partners. If you’re still not sure about the agencies on your shortlist search thousands of marketing agencies on AgencySpotter.com. Read their independently verified client reviews, discover what brands they’ve worked with, what industry experience they have, and which projects or campaigns they are most proud of.